Our product range includes a wide range of commercial mineral water plant. 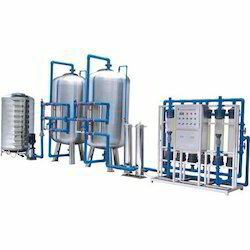 We are the leading manufacturer, trader, and supplier of supreme quality SS Mineral Water Plant. The offered plant is used in various areas such as textile wastewater recycling, dyes & chemical industry, pharma industry, dairy and paper, food and sugar industry, etc. These water plants are manufactured using high-grade components and are tested on various parameters in order to ensure flawlessness. Our valuable clients can avail these products at market leading prices.